Pictures from Brueghel and Other Poems by William Carlos Williams was first published by New Directions in 1962. The book consists of a collection of 105 poems (figs. 3-5) written from 1949-1962. Akin to Williams’s imagist poetry, the beginning of the book consists of a collection of 10 poems based on paintings by the titular Flemish painter, Pieter Brueghel the Elder. The collection of poetry also presents the trajectory and refinement of William Carlos Williams’s own late-life poetry as well as it served as the final poetry collection published during his lifetime. In 1963, Pictures from Brueghel and Other Poems won the Pulitzer Prize in Poetry along $500 that went with the distinction of winning said award; William Carlos Williams received the award posthumously for Williams died two months prior to winning the Pulitzer Prize in Poetry. 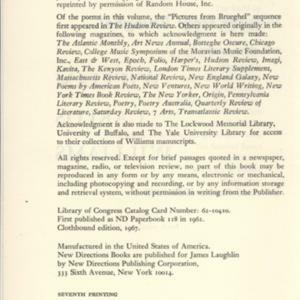 The edition being exhibited is from a later printing run (seventh) which differs from the first printing regarding both the exterior presentation as it nominates the prize awarded to the book as well as the interior where an afterword by close friend to William Carlos Williams, John C. Thirlwall was included after the book was awarded the Pulitzer Prize in Poetry. The award served as precedent to the begging of a line of Pulitzer Prize-winning poets published under New Directions, spanning from 1966 to 1975; a total of three poets published by New Directions managed to produce Pulitzer Prize-winning poetry books in said span of time (Richard Eberhart in 1966, George Oppen in 1969 and Gary Snyder in 1975). William Carlos Williams’s poetic style for “Pictures from Brueghel” gave its readers the “impression that […] the word ‘poetry’ [could be] substituted for ‘paintings’” because of Williams’s own ability to “avoid the respective Procrustean beds of inherited tradition and [discovering] the unique forms best suited to [his] realistic visions of the earth and of the men who inhabit it” (Conarroe 566). This meant that the simplistic employment of vocabulary through Williams’s own style serves as a means for the reader to perceive Williams’s own work as merely as authentic as the reality which the person inhabits. Regarding the form of the poetry found in this book, it “lacks conventional emphasis” breaking away from conventional poetic form “making it possible to read the poems as one reads a painting” where “the viewer’s own volition” (568) dictates the pace of savoring the work, leaving the experience of reading the poetry to be like that of viewing the same paintings that the poetry interprets through text. The seventh printing of Pictures from Brueghel and Other Poems has some subtle changes when it comes to its covers (both front and back). The most noticeable of these changes comes in the form of the Pulitzer Prize in Poetry typed at the bottom of the front cover (Fig. 1) in white letters. Although typed at the bottom of the front cover, the prize nomination contrasts its mostly black background while William Carlos Williams’s name overlay a mostly gray background. This results in the prize nomination jumping out more towards the reader. The changes in the back cover of the book were more explicit in comparison to those of the front cover. 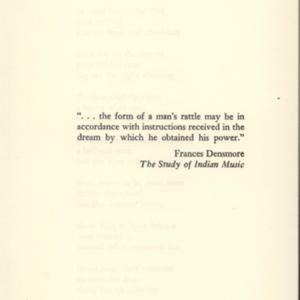 The very first line of text on the back cover (Fig. 2) of the book is the Pulitzer Prize in Poetry award that the book won. This line situates itself before both, the title of the book and the author’s name. New Directions, the publishing company for this book, arranged the information in such fashion giving emphasis to the importance of the award more than to the book itself. 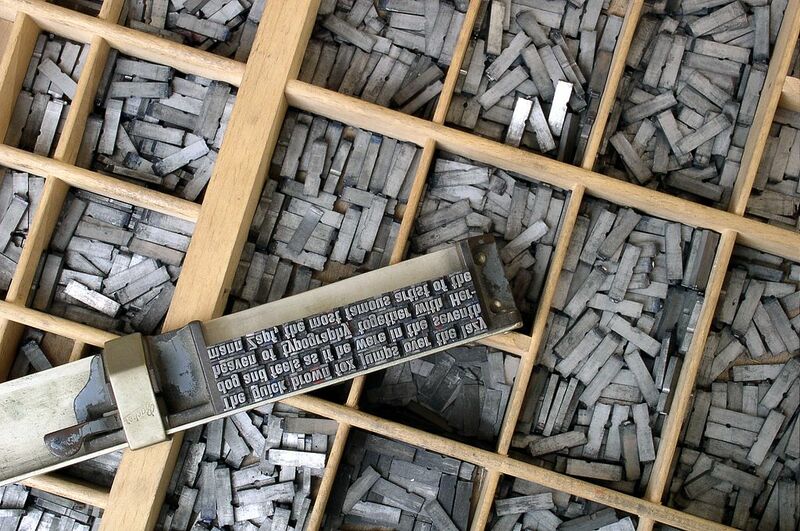 Another point of interest comes in the form of the typeset that this prize nomination uses. It contrasts with the rest of the typeset of the back cover. Instead of being regular black text, the typeset for this prize nomination is stylized, with only the outlines of the font being black while the inside remains white. Besides the inclusion of the prize nomination, the back cover also present the alternative title for the book: Collected Poems 1950-1962. 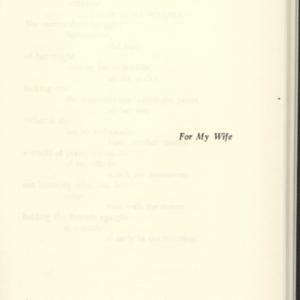 This title was the result of a marketing strategy employed by New Directions where they were seeking to disseminate William Carlos Williams’s works to a greater audience “in 1960, Laughlin’s fi­rst move to bring Williams back into the fold after the hiatus of the 1950s was to plan for a comprehensive series of all of Williams’s books in matching clothbound “library” format” (Fox 84). 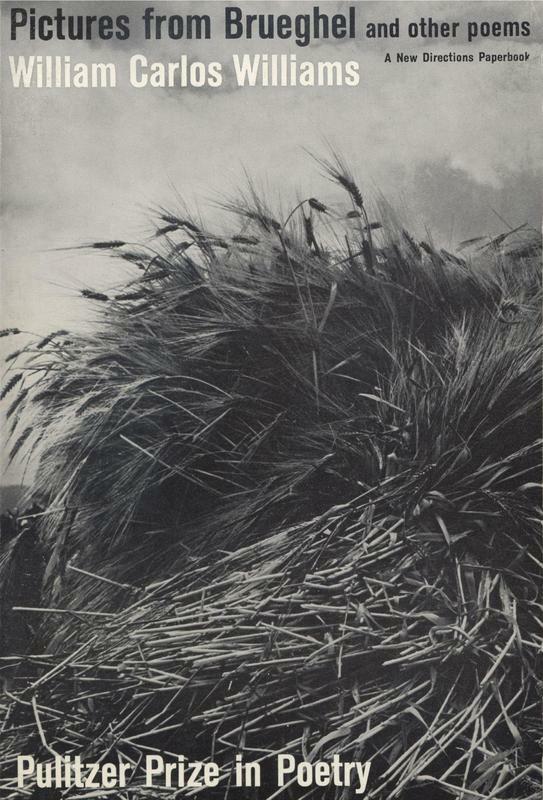 This alternate clothbound version of the book was intended for sale to libraries; its first production was in 1967, making this seventh printing run the first to advertise the alternate version of the book “the cloth edition for the “library” series, with the sub-title ‘Collected Poems 1950-1962,’ did not appear until 1967” (84). Finally, the back cover also includes a sentence detailing how the book was awarded the Pulitzer Prize in Poetry merely two months after William Carlos Williams’s death. This sentence is located between a short description of the book’s contents and a list of other works by William Carlos Williams. 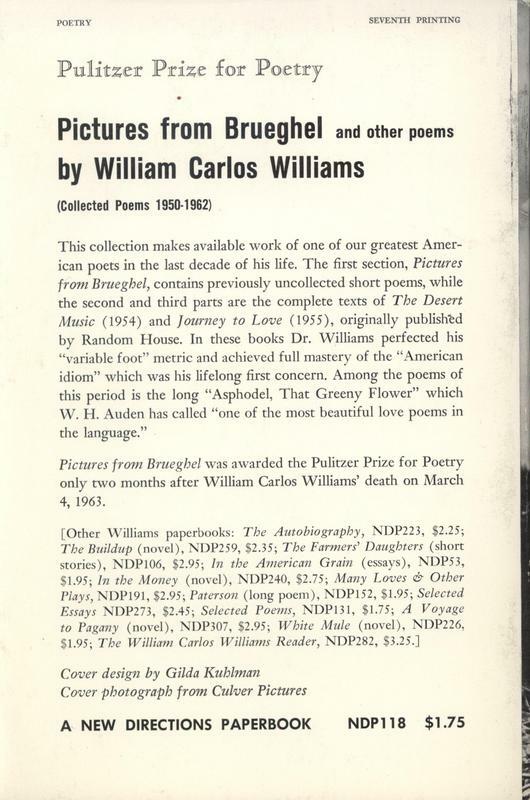 As the back cover for Pictures from Brueghel and Other Poems indicate, William Carlos Williams managed to win the Pulitzer Prize in Poetry just two months after his death. Pictures from Brueghel was not William Carlos Williams’s first work considered for winning the Pulitzer Prize in Poetry, instead, the judges had been contemplated awarding Williams some 10 years prior for either The Collected Earlier Poems or Patterson. Williams was tied to win the award in 1952 alongside Marianne C. Moore but ultimately lost for “the Advisory Board did not want to split the award, the Committee decided in favor of […] Moore” (Fischer 409). His award win for Pictures from Brueghel was more of an afterthought, granting Williams the recognition that the award committee recognized he deserved stating that “Williams is unquestionably the best candidate for the Pulitzer Prize” (413). The award served as an ironic reminder that, not only was Williams a well of influence for other Pulitzer Prize winners but when he managed to win the prize, it was not in his lifetime “It is something of an irony that, while (William Carlos) Williams has been signally honored… he has never received a Pulitzer Prize. It is high time that the committee recognize him, as have practically all of the poets in the U.S.A, many of whom have been influenced by his integrity, his strength of utterance, and his dedication to essential poetry of things instead of the usual abstractions” finally leading the “Advisory Board [award] him the prize posthumously for the volume Pictures from Brueghel and Other Poems” (413). Pictures from Brueghel and Other Poems consists of 105 poems divided into three parts. The first of these three parts (Fig. 8) titled “Pictures from Brueghel” consists of 73 poems that William Carlos Williams wrote in the ten years prior to the book’s publication. The titular first part “Pictures from Brueghel” compiles ten poems, all of which are examples of ekphrastic poetry, where each poem “entails some transformation or interconnection between verbal and visual experience” (Prinz 92) fusing the gap between both text and paintings. Williams’s imagist aesthetic enables the simple and concise parallelisms between Brueghel’s own paintings and their textual interpretations in Williams’s own poetry. This intermediary exploration of poetry and paintings was nothing new for “Williams took painting as a subject throughout his career” taking inspiration for his poetry from other painters such as Fragonard and Jackson Pollock (92). The final part (Fig. 10) of the book consists of another collection of poems first published in 1955 titled “Journey to Love.” Random House Books previously published this section consisting of 20 poems and much like “The Desert Music and Other Poems.” For Williams, “The ‘relativist or variable foot’ was […] the base of all poetic principle, as he was to show in A Journey to Love” (Thrilwall 19) resulting in more experimentation of poetic form and foot, specifically with his use of triadic lines. The greatest example of this experimentation results with “Journey to Love’s” final poem, “Asphodel That Greeny Flower,” one of Williams longest poems spanning over 30 pages long. This poem “is a centerpiece of the later lyrics, easily the longest poem using the triadic line,” (Carlson 39) a style of poetry that many other poems found in Pictures from Brueghel and Other Poems follow. As previously indicated in the divisions of the book, Pictures from Brueghel and Other Poems mostly consists of previously published works by William Carlos Williams. 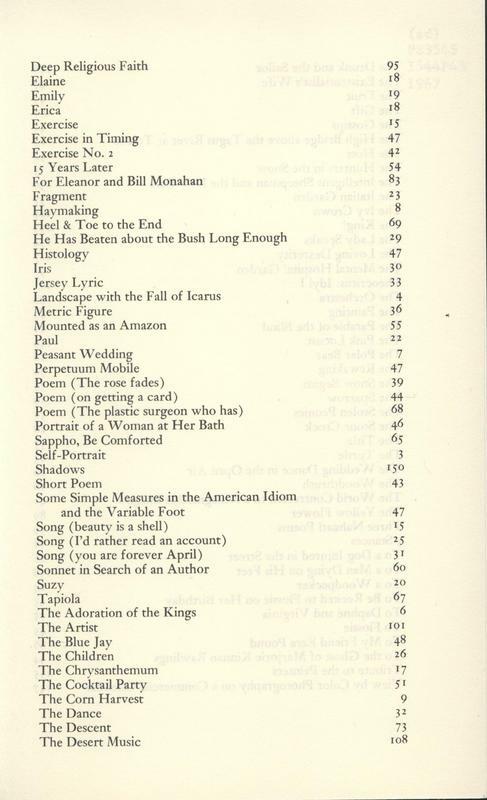 Random House Books previously published a great bulk of the material, consisting mostly of William Carlos Williams’s poetry spanning from 1949 to 1955. This was due to a falling out between William Carlos Williams and New Directions founder, James Laughlin. 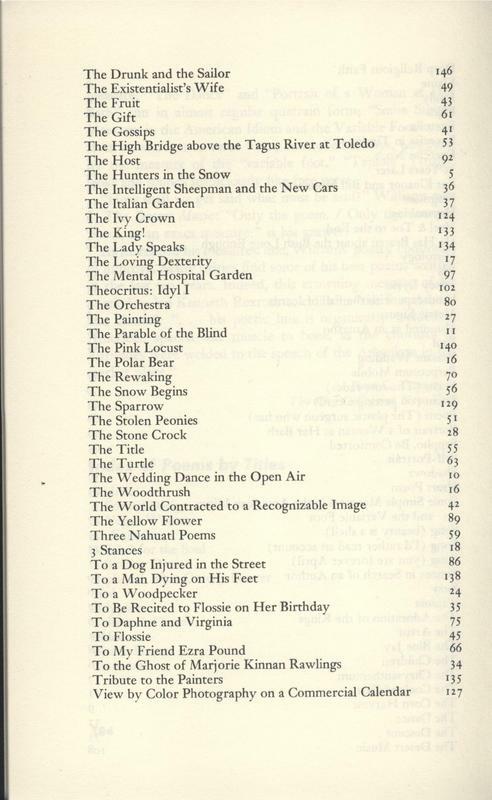 Also, many poems from the “Pictures from Brueghel” section were published in a wide array of periodicals, all of which are named on the copyrights page of the book (Fig. 11). The book’s internals remained mostly unchanged in printing runs following the Pulitzer Prize award win. The most apparent change comes in the form of added content: an afterword titled “Ten Years of a New Rhythm” by John C. Thirlwall. Also, the copyrights page of this seventh printing presents the inclusion of a clothbound edition of Pictures from Brueghel and Other Poems alternately titled Collected Poems 1950-1962. In this afterword, John C. Thrilwall describes the style of William Carlos Williams poetics, diving into some detail concerning Williams’s “variable foot” which produced what William Carlos Williams named “versos sueltos” (loose verses). Thirlwall also states that the poems from Pictures from Brueghel and Other Poems (specifically those included in the first part of the book) were written within a span of ten years since the book’s own publication. For instance, the poem “Heel and Toe,” written merely a year before the book’s publication. Thirlwall details how Williams managed, through a career-long process, perfect his rhythm, staying away from free verse and conventional meter patterns (such as iambic pentameter) for Williams wanted to create his own rhythm in his poetry (Thirlwall 17). This resulted in the birth of his own measure, whose foot fluxed to better simulate speech. This stylistic change became both, most apparent and refined through Williams’ later poems, particularly those written in his later years of life. 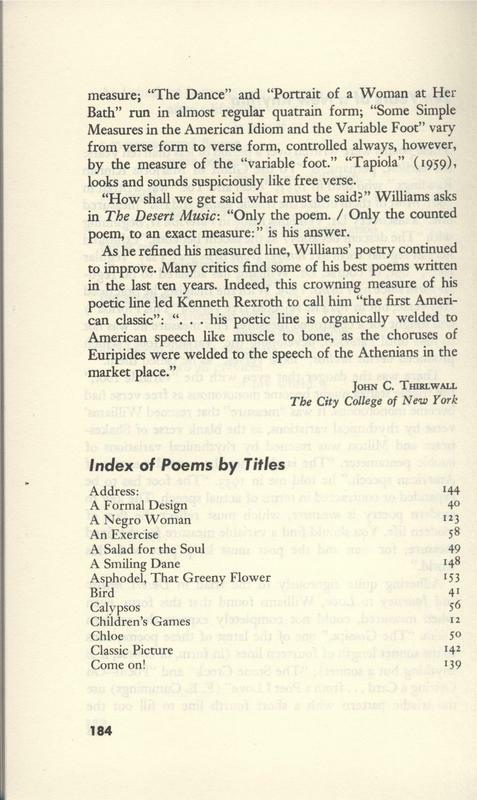 Thirlwall closes this afterword with words of praise by Kenneth Rexroth, a contemporary poet to Williams’, describing Williams’ poetry as “the first American classic” as well as singing praise to Williams’ poetics and how “organically welded to American speech” (Thirlwall 184) they were, refraining back to the idea that Williams’ style tries to emulate speech as accurately as possible. Carlson, Celia. “Compelling Objects: Form and Emotion in Williams’s Lyric Poetry.” William Carlos Williams Review, vol. 26, no. 1, 2006, pp. 27–50. Conarroe, Joel. “The Measured Dance: Williams' ‘Pictures from Brueghel.’” Journal of Modern Literature, vol. 1, no. 4, 1971, pp. 565–577. Fischer, Heinz-D., and Erika J. Fischer. Complete Historical Handbook of the Pulitzer Prize System 1917-2000: Decision-Making Processes in all Award Categories based on unpublished Sources. Vol. 17. Walter de Gruyter, 2003. Fox, Peggy L. “William Carlos Williams and New Directions: The Care and Feeding of a Literary Reputation.” William Carlos Williams Review, vol. 29, no. 1, 2009, pp. 83–90. Middleton, Peter. 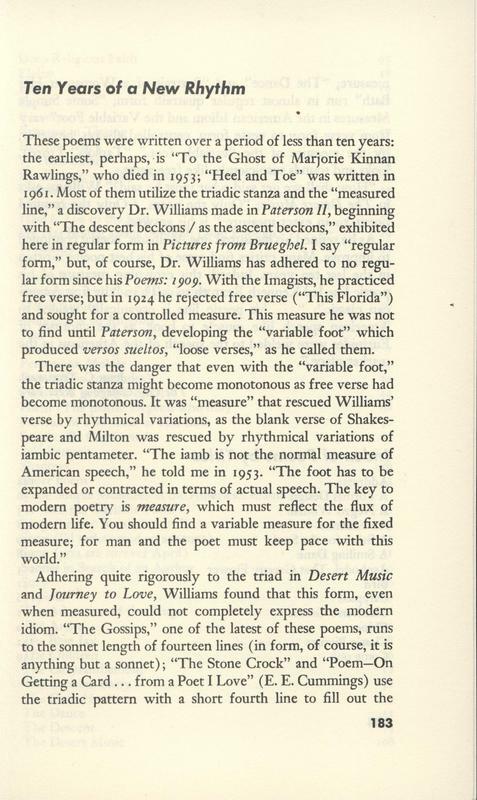 “The Voices in ‘The Desert Music.’” William Carlos Williams Review, vol. 27, no. 2, 2009, pp. 169–178. Prinz, Jessica. “Betwixt and Between”: Duchamp and Williams on Words and Things.” William Carlos Williams Review, vol. 28, no. 1-2, 2011, pp. 79–100. 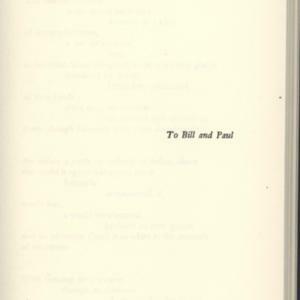 Thirlwall, John C. “WILLIAM CARLOS WILLIAMS AND JOHN THIRLWALL: RECORD OF A TEN-YEAR RELATIONSHIP.” The Yale University Library Gazette, vol. 45, no. 1, 1970, pp. 15–21. Williams, William Carlos. Pictures from Brueghel and Other Poems. New Directions, 1967.